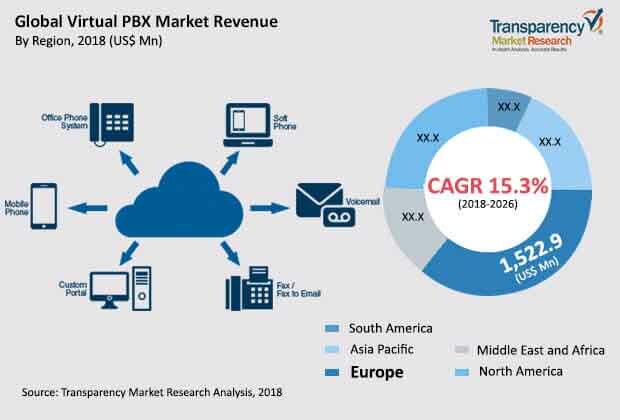 According to a new market report related to the Virtual PBX market published by Transparency Market Research, the global Virtual PBX market is projected to reach US$ 14,368.4 Mn by 2026 driven by reduction in total cost of ownership in deploying Virtual PBX. The market is projected to expand at a CAGR of 15.3% during the forecast period from 2018 to 2026. Growth of the market is attributed to rise in demand for Virtual PBX and increase in adoption of cloud-based deployment models to offer quality services to clients. Americas is anticipated to lead the global Virtual PBX market, followed by Asia Pacific and Europe, during the forecast period. The Virtual PBX market is in an emerging stage and is anticipated to expand rapidly in the next few years. A hosted PBX system helps reduce the total cost of ownership by bringing capital expenditure to the minimal as the system requires only the yearly fees of phones unlike an on-premise PBX solution which requires a PBX server, annual maintenance, and in-house IT staff.There are numerous additional benefits apart from the quantifiable benefits of a hosted PBX solution that are hard to quantify, such as freeing up staff time who would have been managing on-premise PBX, increased employee productivity, and improved customer satisfaction as the companies could reach an individual quickly. Also, by paying monthly subscription charges, companies could convert their capital expenditure into operational expenditure. Cost savings through reduced phone and fax charges, eliminating PBX hardware requirements, and reduced administration costs is driving the Virtual PBX market. The impact of this driver is expected to be high during the forecast period as all businesses experience cost pressure and look to reduce the same on priority, and hosted PBX helps in reducing a considerable 25%-30% of total cost of ownership. Based on enterprise size, the global Virtual PBX market has been segmented into small & micro enterprises, medium enterprises, and large enterprises. The small & micro enterprises segment is expected to dominate the global market in 2017. Small & micro enterprises have deployed Virtual PBX the most and contributed significantly to the growth of the market. Americas led the Virtual PBX market, accounting for substantial share in 2017. The U.S. is the major market for Virtual PBX solutions in the region. Virtual PBX solutions are also gaining popularity in Canada and Rest of Americas.The Virtual PBX market in Europe and Asia Pacific is also expected to expand at a rapid pace during the forecast period. The research study includes profiles of leading companies operating in the global Virtual PBX market. Key players profiled in the report include 3CX Ltd., Alpha Telecom Services Inc., Mitel Networks Corporation, RingCentral, Inc., BroadSoft, Inc., BCE Inc., TELUS, TeraGo Networks Inc., 8x8, Inc., Digitcom, AllStream, Inc., Voysis IP Solutions Inc., AstraQom, Introtel, Birch Communications, Inc., and Nextiva, Inc.